Five days, nine presentations, and an overwhelming response to following the ethical teachings of Jesus. We began Monday night with my story, found in the first chapter of Finding the Father. We discussed not only why having the correct picture of God is important, but also how Jesus is our definitive clue to what kind of a being God really is. On Tuesday, we spent two sessions looking at how the Jesus story gives us a radically different answer as to how there could be a God out there that looks like Jesus and yet this world can be so messed up. On Wednesday, we spent the day looking at the differences between what I call the juvenile imposed paradigm and the much more mature intrinsic paradigm of relating to God and how Jesus calls us out of one and into the other. On Thursday, we addressed some of the ethical concerns expressed by so many with the God of the Old Testament and why, at times, there seems to be such a contradiction between that God and the God we see in Jesus, with a call to actually begin living by the ethics we find in the Sermon on the Mount. 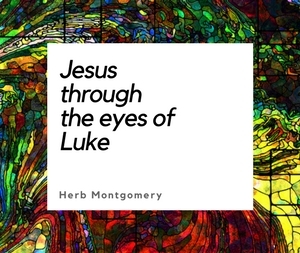 Then on Friday, two presentations were devoted to the death and resurrection of Jesus through the lens of the Jesus story and how, through these, God established a radically reoriented way of living here and now, based on a radically reoriented way of seeing God, ourselves, and everyone around us. I’m so humbled to say that, at the end of Friday night’s session, I gave the students the opportunity, not just to be “believers in” Jesus, but to actually become FOLLOWERS of Jesus and his radical teachings. By my best estimation, the entire student body, with the exception of a very small handful, stood up and came forward in response to the gospel of the Kingdom. It was an amazing week. And if any of you students are actually reading this (I know many of you have been downloading presentations from our library over the past few weeks), I just want to say that you are beautiful. You are my heroes. You give me hope. Thank YOU for all that you taught ME while I was with you. Stay centered in Jesus and keep following him. Remember, it’s about a person, not a religion. I love you guys and . . .
. . . welcome to the Kingdom.